Dean Saunders insists Chesterfield are ‘not far away’ despite a run of four games without a win. Saunders’ side head to rock bottom Blackpool tonight after late goals cost them points in their last three matches, including Saturday’s last gasp defeat to Burton Albion. And the Spireites boss says fine margins are proving the difference for his side at the minute. “Things are not going our way at the moment,” Saunders said. “We’ve lost late goals in the last three home games but if you’d have stopped the clock dead on 90 minutes we’d have enough points to be second in the league. “That shows the fine line between doing well and not doing well. “There are nerves for sure but sometimes those late goals tighten you up a bit and you don’t make the silly mistakes. “But in defence of the players, on Saturday we got it wrong trying to win the game. “How the referee didn’t give us a penalty just before they scored I’ll never know and we could have been talking about a 2-1 win with things feeling very different. “But we’re creating chances, playing well as a team. Gboly Ariyibi and Armand Gnanduillet missed open goals but they got into the right positions to score. Saunders will be without Lee Novak (thigh), Ariyibi (international duty) and Byron Harrison (knee) but Mani Dieseruvwe will be available after a one match ban. Ariyibi is away with the US Olympic squad for qualifying and could be replaced by Chris Herd though Saunders could be tempted to freshen his side. 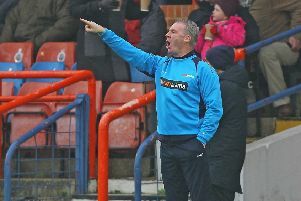 Neil McDonald’s Blackpool – relegated from the Premier League in 2013 and from the Championship this year – have managed just one will in all competitions this season, against Scunthorpe in League Two. They lost 2-0 at Shrewsbury Town at the weekend and they haven’t won a home game since January, a game that saw former Spireite Jamie O’Hara score the game’s only goal against Brighton & Hove Albion. His main concern won’t just be the last gasp goals; Chesterfield have conceded ten of their 16 goals in the final 15 minutes compared to scoring just 2 (of 14) in the same time period.